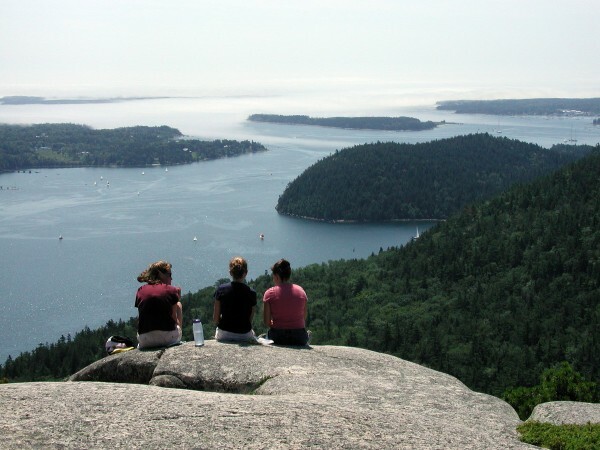 Hikers sit on top of Acadia Mountain, overlooking Somes Sound, in 2003. As fall arrives, I feel luckier than ever to live alongside Acadia National Park. With bursts of colorful foliage appearing on the mountainsides and the summer rush easing, I can more fully appreciate the park’s glory. The spectacular shoreline, trails and wildlife at Acadia inspire millions of people each year and serve as a magnet for economic activity throughout Maine . But with each passing autumn day, Acadia finds itself closer to devastating budget cuts through the federal budget “sequester” scheduled for January 2013. If Congress doesn’t agree on a budget, the National Park Service could see a deep cut of 8.2 percent, which would likely mean closed visitor centers, campgrounds and museums around the country and possibly put thousands of rangers and other park employees out of a job. The ripple effect of park cuts would reach many Maine residents and business owners whose livelihoods and well-being depend in part on a high-quality Acadia experience. As visitation to Acadia grows ( up 3.6 percent on average during the last two years), available operation funds shrink. The annual operations shortfall for all national parks combined is estimated at $500 million to $600 million, and Congress has decreased funding for the past two years. Acadia has shown ingenuity and thrift in keeping the park operating so well in the face of these cuts, but the hiring gaps, reduced travel and training and deferred maintenance will inevitably catch up with us. Then the park experience we all enjoy and rely upon will be diminished. The impact of these cuts would be felt by families, communities and businesses across Maine and across America. Studies from every angle have concluded that national parks represent a great value. They are wildly popular among the American people, and they generate tremendous returns for every dollar invested. In 2010, visitors to the National Park Service supported more than $31 billion in spending and 258,000 American jobs. Acadia’s visitors spent more than $186 million, generating more than 3,100 jobs and creating more than $79 million in labor income. All these benefits stem from an agency — the National Park Service — with a budget representing just one-fourteenth of one percent of the total annual federal spending. These are challenging times in Washington, with election-year politics hardening party lines. However, the national parks present a rare opportunity for accord. A recent bipartisan poll found that 92 percent of American voters think that federal spending on national parks should be increased or kept the same. Some respondents undoubtedly understand the economic impact of parks and some, like me, may even live near the parks, but the vast majority are likely expressing what they feel is logical and right: honoring a deeply felt sense of responsibility that we as a nation owe to our most magnificent landscapes and historic sites. And they aren’t just saying so in polls. They are voting with their visits too, with almost 279 million nationwide to national parks last year. I am often asked why Friends of Acadia (FOA), as a nonprofit partner working to tap private volunteer stewardship and philanthropy to benefit the park, can’t simply raise more money to compensate for what Congress does not provide. FOA is already helping the park stretch its limited resources by providing matching funds toward maintaining and restoring Acadia’s 125 miles of hiking trails and 45 miles of carriage roads, funding youth initiatives and partnering to support the Island Explorer bus system, which has carried more than 4.3 million riders since its inception. But it is hard to inspire private donors to invest in the park at the same time Congress is dis-investing. Friends of Acadia’s role is to supplement, not replace, the role of Congress to fund the park service’s mission to care for the priceless assets entrusted to it. With this balance maintained, partners like Friends of Acadia can provide a margin of excellence, enriching both the visitor experience and the community benefits of our national parks. As Acadia National Park approaches its centennial in 2016, it has something for everyone: rich historic sites, spectacular scenery, outstanding recreational opportunities, habitats for wildlife, educational offerings and economic benefits flowing to neighboring communities. All that’s missing is the assurance of sustainable public funding that keeps pace with Acadia’s worthwhile and popular public mission. Please join me in asking our elected officials to work with our leaders on a budget that doesn’t put our national parks at risk. Whether connecting youth to our nation’s history and landscapes or promoting healthy lifestyles for families, the significance of these places to Americans will only grow over time. Acadia National Park and other national parks across the nation benefit all Americans and should be protected for future generations to enjoy. David MacDonald, of Mount Desert, is president of Friends of Acadia, an independent organization devoted to preserving, protecting and promoting stewardship of Acadia National Park and its surrounding communities.